Ai Weiwei’s work is currently showing at Haus der Kunst in Munich. The major solo exhibition titled “So Sorry” is authenticating the artist’s move towards increasingly political realm. Older works by Ai Weiwei will be shown at the German art house along with two newly commissioned ones. Chris Dercon, the curator of the show, and Ai Weiwei conceived of the large-scale collaboration almost three years ago. One of the most important Chinese artists of 20th century, Ai Weiwei does not allow place for contextual involvement that surpasses his artistic intentions. This is not to say that any possibility of “third meaning” is denied, yet it is manipulated to an extent that the relationship between the work and the space of the museum becomes parallel to the dynamics of a dictatorial system. The history of Haus der Kunst – the Third Reich’s first monumental propaganda building commissioned by Hitler to display German art – is put into the servitude of Ai Weiwei’s political message masterfully, thus symptomatic of accordingly the artist’s achievement and curatorial ideal- one where the curator achieves the illusion of absence. Ai Weiwei’s show at Haus der Kunst runs through January 17, 2010. “We all need to give our opinion about it or have to make some kind of judgment; otherwise we are a part of it” says Ai Weiwei about the reigning political regime in China. The artist who was beaten by Chinese police resulting in brain hemorrhage, has become more actively involved in his criticism of the system as opposed to being silenced. Using every means of public broadcast, ranging from a twitter account to a blog which is being regularly shut down for its call for freedom of speech, Ai Weiwei has established a new kind of artistic practice, where expression is not autonomously the condition of artistic path, but rather obviously its message. 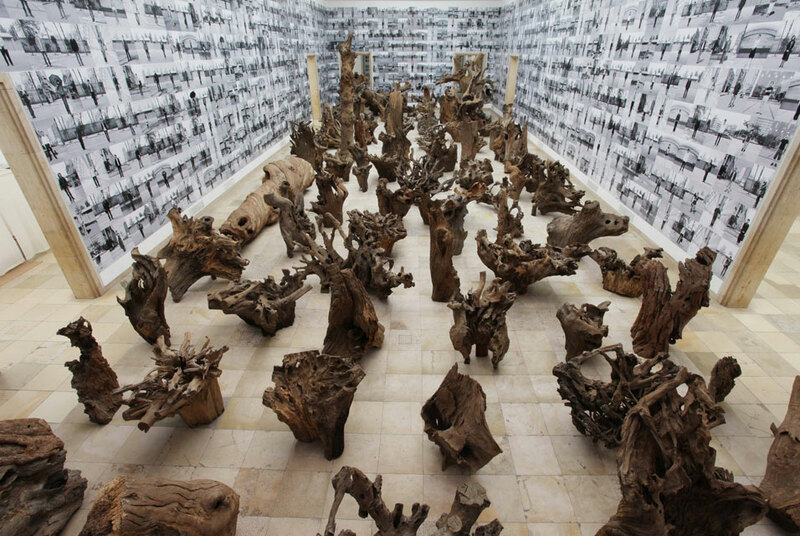 One of the works on view is an installation of 100 roots and tree parts growing out of the Haus der Kunst’s floor, quite literally engaging in an active open dialogue with its past, while maintaining an upper hand as art becomes reminiscent of what it represents: dictatorship. The roots are placed on “Soft Ground” a work comprised of 929 tiles that are a faithful reproduction of the patterns of the floor beneath them. Also showing at Haus der Kunst are Ai Weiwei’s older works and a documentation of those works. 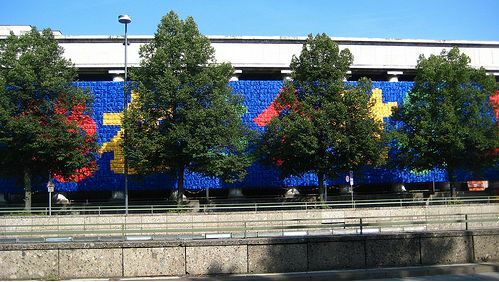 For instance the walls of the biggest exhibition space in the building is covered with photographs of the Chinese individuals that the artist flew in to 2007 “Documenta” exhibit in Kassel. An interesting curatorial decision was the creation of a blog on Haus der Kunst website where Ai Weiwei posts for the first time in English. Known for distributing information and ideas restricted by the Chinese government through means of blogging, the artist’s reporting on the development of the show is appropriately reinforcing the notion of speaking up for freedom of speech and press as art. This entry was posted on Friday, October 23rd, 2009 at 1:11 pm	and is filed under Go See. You can follow any responses to this entry through the RSS 2.0 feed. You can leave a response, or trackback from your own site.